Aaw, I love the bunny night lights. Very cute. What a lovely list, I think I want to print it and keep it on my desk!! Beautiful! Oh Jennie if only telling myself I only have one face/pair of hands/set of feet to wear make up, nail polish and shoes would work! Sigh. 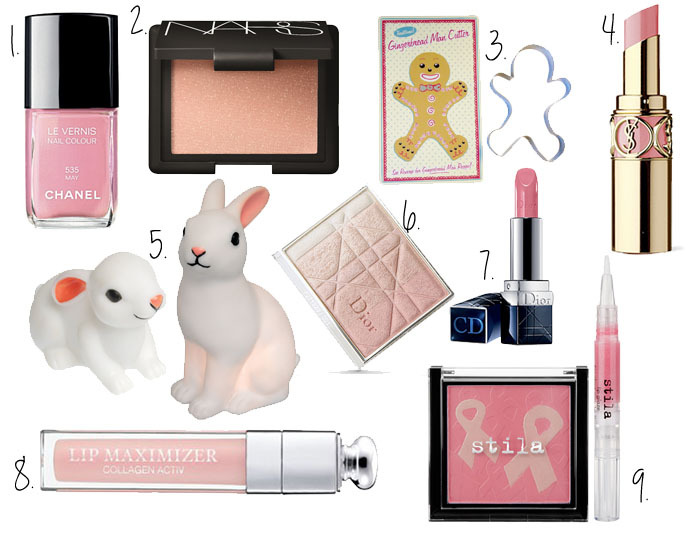 Lovely wish list :) very pink! I've wanted that YSL lipstick for forever! The color just looks so, so pretty. Oh and the Dior Highlighter looks great, too. I have Amber Diamond and love it, I'm sure the rose one is nice as well! Everything is so pink and lovely! I want Amber Diamond from Dior. Ah everything has pink in it :) I love the sound of the Dior lip maximiser! I already have so many things on my wishlist, but it seems I'll be adding some of these on it too! !